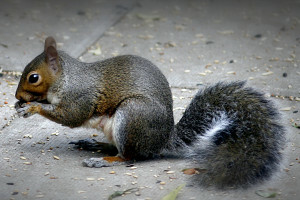 Squirrels are very common pests in the USA. There are different ways that you can humanely eradicate or control the problem. Unfortunately, it is difficult to fully remove squirrels from an area by using trapping alone. There are simply so many of them around that when you remove a few of them, more are likely to take their place very quickly. 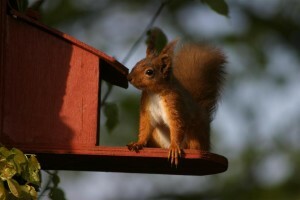 Therefore, one often has to use alternative strategies to keep squirrels from damaging property or entering the home. One has to make sure that there are not things in the yard or home that entice squirrels. This is extremely important. One way that you can keep out squirrels is by fencing. Fencing can be used to keep squirrels out of areas, such as gardens. When a all enclosing fence of a chicken wire like material is used, squirrels are unable to enter the fenced areas. This can make sure that your outdoor gardens are safe while you take care of the problem. Something else that you can do to get squirrels out of your home and yard is by putting out the urine of predators. You can actually purchase urine of squirrel’s natural predators, such as foxes. When squirrels notice the scent, they will believe that there is a predator nearby. If they think this, they will leave the yard. They are unlikely to return if the scent of the urine is still there. If squirrels appear to be drawn to enter the house itself through the attic, getting rid of the squirrel problem can be as simple as sealing up the house. Check for any areas where they could be getting in. Make sure to check for any openings in the roof. Also, windowsills can sometimes provide an entry point. This is all especially important if there are trees that are near the house. If this seems to be an issue, you can actually have professional roofers come in and examine your home to seal up any openings. This is often very effective at preventing the entry of the squirrels. Another thing that you can do is to use lights and noises that will annoy the squirrels to leave. Sometimes, leaving a radio playing at low volume outdoors can drive them out. Of course, this may or may not be appropriate depending on your neighbors. In addition, you can also put in outdoor LED lights. This can cause squirrels to flee the yard, because of being annoyed by the lights. However, the LED lights can be ones that only emit a light glow. They do not have to be extremely bright to drive squirrels away. Therefore, it is possible to use LED lights to drive out the squirrels without driving your neighbors crazy.